Milton F. Amrine, Warden of the Kansas State Penitentiary at Lansing, Kansas, presents Governor Andrew F. Schoeppel's office, of Topeka, with his statement of resignation. 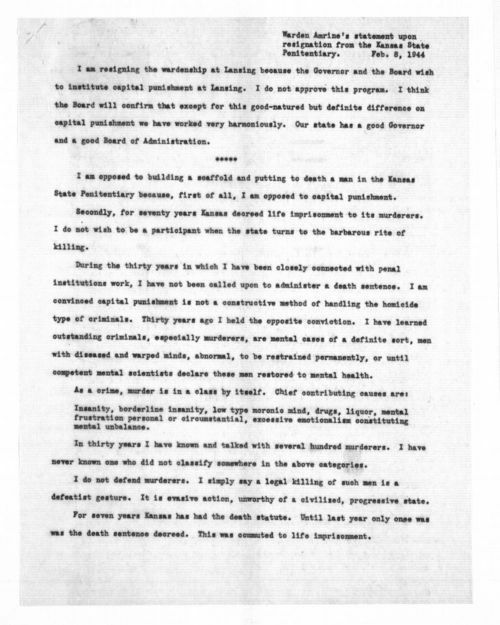 Amrine resigned due to his strong opposition to capital punishment and this statement outlines the reasons for his opposition. Kansas reinstated the death penalty in 1935 after its repeal in 1907, but the state had not executed any person since 1870. Convicted murderer Fred L. Brady was poised to become the first person executed under the new law. Governor Schoeppel refused to commute Brady's sentence to life imprisonment. Warden Amrine refused to carry out the execution and chose to resign.